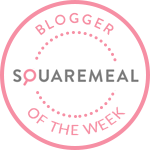 Emily's Recipes and Reviews | UK Food Blog | Leicestershire : paneer and pilau fritters with veetee rice. These paneer and pilau rice fritters make for the perfect Indian inspired starter, snack or even as Asian style tapas. I've teamed up with Veetee rice to great creative in the kitchen, featuring their super convenient rice flavours as the star ingredient. Made from pilau rice, scatterings of paneer and peas, they're so simple to make, easy to adjust spice levels and are vegetarian and gluten free too. I've teamed the crunchy fritters with a cool and zesty lemon, mint and yogurt dip - with the fresh flavours bringing out the warm Indian spices. Step one. Mix together the rice with the spices and peas. Step two. Add in the paneer, eggs and cornflour as well as salt and pepper to season. Step three. Add the oil to a shallow frying pan and turn on to a medium-high heat. Step four. Whilst this is heating up, combine the dip ingredients so they are ready to serve. Tip: When you think the oil might be hot enough, drop in a grain of rice. If it started to immediately fry - it's ready to go! Step five. Carefully spoon in a large teaspoon of the ingredients and fry the fritters in batches. Lay on kitchen towel to absorb any excess grease. Serve up immediately with the dip - in pretty bowls of course! What are your favourite rice recipes? Or perhaps a go-to Indian inspired snack or starter? Find more inspiration over at Veetee's recipe page! In collaboration with Veetee, as part of the Veetee Blogger Community. I love fritters, especially cheesy ones. What a great use of the Veetee rice. What a brilliant idea. I never would have thought to use prepared rice to in my cooking, but it's a brilliant time saver. The fritters sound delicious. These sound gorgeous Emily. I love paneer, but would never have thought to use it in this way. Great recipe... That is so convenient… and so quick! My rice always seems to come out overcooked & a little on the mucky side!